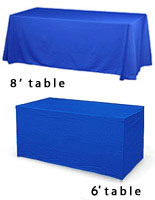 This 8-foot convertible table throw will easily drape over most 8-foot tables, yet can also be converted into a fitted cover for a 6-foot table. Simply fold the side panels and use the sewn-on hook and loop attachments to secure them. 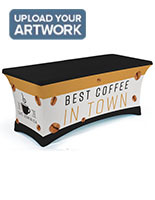 This convertible table throw is a great investment because it can be reused. 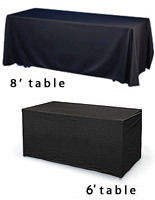 The polyester twill fabric is machine washable, wrinkle resistant and flame retardant to provide a safe, professional-looking display for any event. 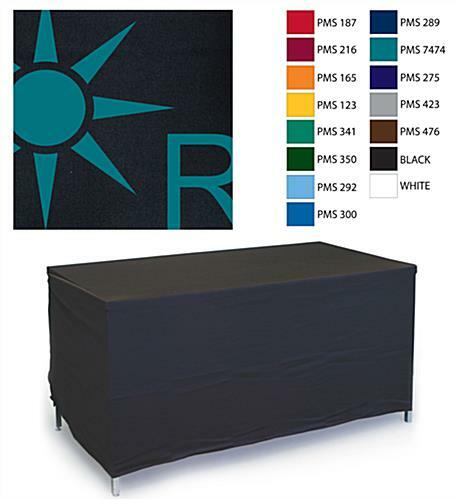 This convertible table throw also ships with your 1-color printed graphics on the front panel. 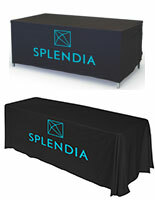 Get your trade show booth noticed in busy convention halls with this custom tablecloth! 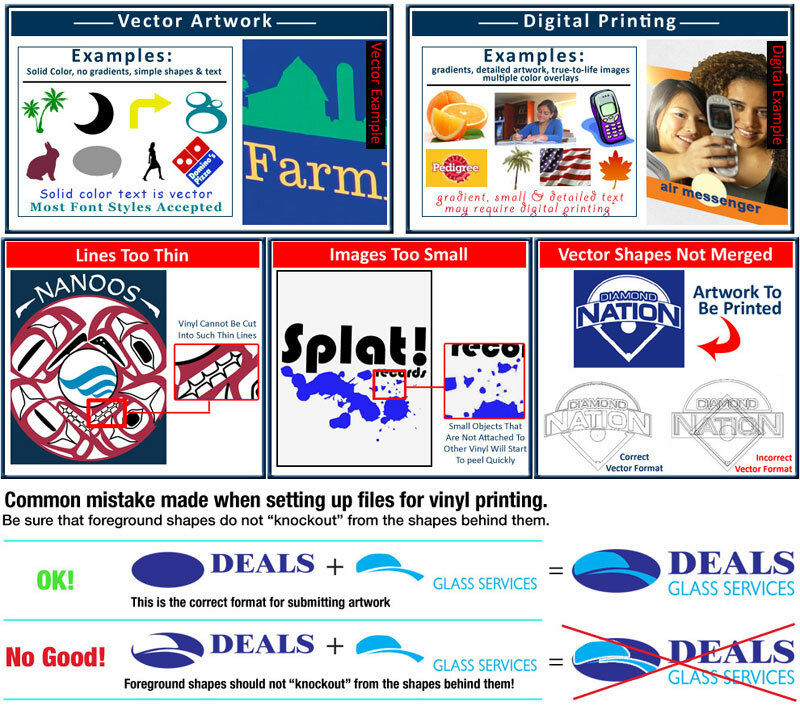 Click Here for Vector Artwork Examples.Examples of correct and incorrect vector formats. Please Note: (4) Rounded Corners. 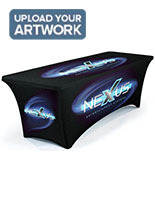 Ordered 5 new table covers for upcoming tradeshows. They all came out great! We're so glad to hear this, Christopher! We hope to work with you again soon. That Table Cover Is Fabulous! I titled my review as "That Table Cover is Fabulous!" because that was one of the comments by someone on Facebook who saw the picture of my display. I am very happy with it. The logo turned out beautiful! 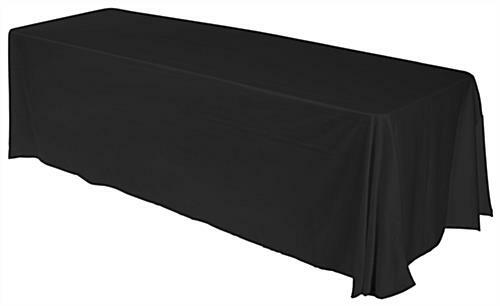 This is a convertible table covering so it is supposed to fit nicely on an 8 foot table & also on a 6 foot table. My only criticism is that I wish instructions on the proper way to fit it for your 6 foot table were included. 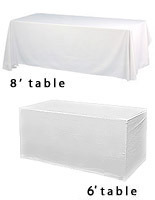 I purchased 2 table coverings & used one on an 8 foot table & the other on a 6 foot, but had difficulty putting the covering on the 6 foot one. We got it looking nice, but I am still not sure we had it on perfectly. The ordering process went smoothly & I received it on the day I was told I would receive it. 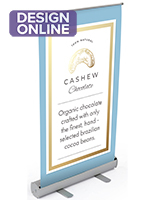 I will definitely recommend DISPLAYS2GO. Thanks for the feedback, Kathleen. Feel free to like us on Facebook and share your photo on our wall as well! We also offer various discounts and coupons regularly that you may find useful in the future.